Ginny Harris is an amateur photographer with a special interest in birds. From age 11 she began reading Peterson field guides and learning to identify local species in Massachusetts and at her aunt’s summer home in Conway, New Hampshire, where she first encountered the beauty of goldfinches and towhees. As a member of a local camera club in Hudson, MA, her nature photos have received high scores in the monthly club competitions. She is a member of Boxborough Birders. Tree swallows at Morrison Farm, Acton. Photo by Ginny Harris. American Goldfinch, Acton. Photo by Ginny Harris. Red tailed Hawk, Steele Farm, Photo by Ginny Harris. 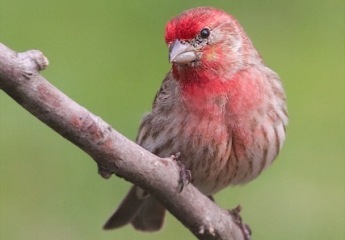 House Finch, Acton. Photo by Ginny Harris. Great blue Heron, Great Meadows, Concord. Photo by Ginny Harris. Cedar Waxwing, Acton Arboretum. Photo by Ginny Harris. Chestnut sided Warbler, Acton. Photo by Ginny Harris. Yellow-rumped warbler at Littleton Heron Rookery, May 2, 2015. Photo by Ginny Harris. Three eastern bluebirds in Acton, Mass. after 2015 blizzard. Photo by Ginny Harris. Rose-breasted grosbeak at Jenks Land, Acton, Mass. May 13, 2015. Photo by Ginny Harris. Purple Finch, Plum Island. Photo by Ginny Harris. Baltimore Oriole, Mount Auburn Cemetery. Photo by Ginny Harris. Canada Goose, Horn Pond, Woburn. Photo by Ginny Harris. Female American Goldfinch, Acton. Photo by Ginny Harris. Black-billed Cuckoo, Acton Arboretum. Photo by Ginny Harris. Female Rose-breasted Grosbeak, Acton. Photo by Ginny Harris. Catbird, Acton. Photo by Ginny Harris. Parula Warbler, Acton Arboretum. Photo by Ginny Harris. Downy Woodpecker, Acton. Photo by Ginny Harris. Loons, Willard Pond, Antrim, NH. Photo by Ginny Harris. Rose-breasted Grosbeak, Jenks Land, Acton. Photo by Ginny Harris. Mourning Dove, Jenks Land, Acton. Photo by Ginny Harris. Chickadee, Acton. Photo by Ginny Harris. Cardinal in winter, storm, Acton. Photo by Ginny Harris. Cardinal in winter, Acton. Photo by Ginny Harris. Immature Red-bellied Woodpecker, Acton. Photo by Ginny Harris. Screech Owl, Red Morph, Acton. Photo by Ginny Harris. Wood Duck, Great Meadows, Concord. Photo by Ginny Harris. Osprey on nest, Swan River, West Dennis. Photo by Ginny Harris. Piping Plover, Crosby Landing, Brewster. Photo by Ginny Harris. Black Skimmers, West Dennis. Photo by Ginny Harris. Black Skimmer, West Dennis. Photo by Ginny Harris.